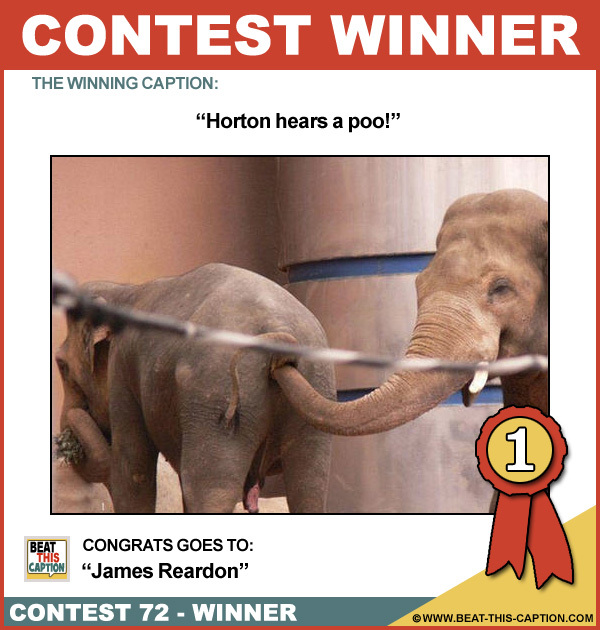 Beat This Caption Contest 72 Winner – Caption Contest Funny Clever Witty Enter Today! You could at least buy me dinner, first! And we’ll keep digging around until everyone one of those midget clowns comes out of there! Quick! Hide the stash. The zookeeper is coming! There, I just tucked your hemorrhoids in! It was early days yet, but Dumbo was sure he could carve out a career in Elephant Ventriloquism! The letter O (upper case), trunk in; the letter o (lower case), trunk out. Teaching braille to blind elephants! As usual, I get stuck with the leftovers!